Definition at line 209 of file mspatcha.c. Definition at line 121 of file mspatcha.c. Definition at line 8 of file mspatcha.c. Definition at line 343 of file mspatcha.c. Definition at line 171 of file mspatcha.c. Definition at line 319 of file mspatcha.c. Definition at line 158 of file mspatcha.c. Referenced by apply_patch(), halveImage3D(), test_FDIIsCabinet(), and validate_signature(). Definition at line 125 of file mspatcha.c. Referenced by apply_patch(), and extract(). Definition at line 163 of file mspatcha.c. Referenced by apply_patch(), and scan_specified_files(). Definition at line 509 of file mspatcha.c. Definition at line 467 of file mspatcha.c. Definition at line 332 of file mspatcha.c. Definition at line 211 of file mspatcha.c. Definition at line 272 of file mspatcha.c. Referenced by calc_crc32(), and crc32(). Definition at line 477 of file mspatcha.c. Definition at line 16 of file mspatcha.c. Definition at line 39 of file mspatcha.c. 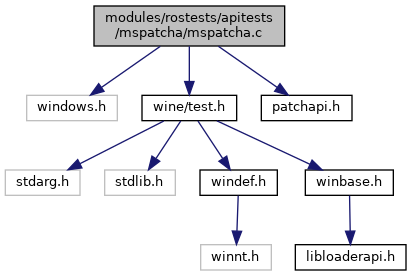 Definition at line 64 of file mspatcha.c. Definition at line 20 of file mspatcha.c. Definition at line 44 of file mspatcha.c. Definition at line 76 of file mspatcha.c. Definition at line 25 of file mspatcha.c. Definition at line 33 of file mspatcha.c. Definition at line 49 of file mspatcha.c. Definition at line 57 of file mspatcha.c. Definition at line 89 of file mspatcha.c. Definition at line 98 of file mspatcha.c. Definition at line 123 of file mspatcha.c. Referenced by apply_patch(), copy_dll_file(), create_temp_file(), create_test_dll(), create_test_dll_sections(), create_test_file(), extract2(), print_something(), START_TEST(), test_CopyFile2(), test_CopyFileA(), test_CopyFileEx(), test_CopyFileW(), test_CopyMetaFile(), test_CreateFile(), test_CreateFile2(), test_CreateFileA(), test_CreateFileMapping_protection(), test_CreateFileW(), test_DeleteFileA(), test_ExitProcess(), test_file_security(), test_filemap_security(), test_GetFinalPathNameByHandleA(), test_GetFinalPathNameByHandleW(), test_GetMappedFileName(), test_GetVolumeNameForVolumeMountPointA(), test_import_resolution(), test_iocp_callback(), test_mapping(), test_MoveFileW(), test_offset_in_overlapped_structure(), test_OleLoadPicturePath(), test_query_recyclebin(), test_read_write(), test_ReplaceFileA(), test_ReplaceFileW(), test_ResolveDelayLoadedAPI(), test_section_access(), test_WriteFileGather(), and unpack_avi_file().